Directions: Use the links to find the answers to the questions. Use the Back Menu to return to the hunt. Hold down on the Back button until the menu opens. Drag down to this page. 1. In the early spring, people collect maple tree sap to make syrup. a. What causes sap to flow? b. How much birch sap does it take to make 1 gallon of birch syrup? c. Compare this to the amount of maple sap needed to make a gallon of syrup. What is the ratio of birch sap needed / to maple sap needed to yield one gallon of syrup? when an author describes a character as a sap. 2. What causes a geothermal hot spring? 3. Metal springs have been used since the Bronze Age. List the kinds of springs. 4. During a long hike on a sunny afternoon, you come across a groundwater spring. The cool water looks tempting. What are the risks of drinking the spring's water? 5. When it is the season of spring in Pennsylvania, it is autumn (fall) in Chile. Explain why the seasons in the Northern Hemisphere are the opposite of the seasons in the Southern Hemisphere. 6. The ancient Greeks had a myth to explain the season of Spring. Write the names of the main characters. 7. Review the Comparison and Contrast Guide @ ReadWriteThink - online activity through "Evaluating". Contrast Orchard Mason Nees with Honeybees. Identify at least 3 differences. Continue reviewing the Comparison and Contrast Guide @ ReadWriteThink - online activity through "Graphic Organizers". Which bee would you prefer to have in your garden? Why? 8. Your class has decided to plant milkweed seeds in the school's habitat garden to help save Monarch Butterflies. What factors will encourage seed germination? 9. Eggs are one commonly seen symbol of the Spring season. Write 2 facinating facts about eggs. 10. 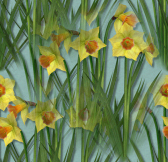 One sign of spring is the blooming of daffodils. When must you plant them? Why? Investigate: Have the hummingbirds returned to your community this spring? Evaluate - Has the past week's weather in your community been helpful or harmful to migrating birds? 12. Bluebirds nesting is a sign of spring to some people. How can people help bluebirds with nesting? A. On a warm spring night, in the Eastern United States, you may hear the chorus of the Spring Peepers. Form a hypothesis. What kind of animal is making that sound? Now use your favorite Internet search engine to learn what they are. For this activity, we used the sense of hearing to make an observation. What other observations could have improved your hypothesis? Spring does not look, sound or feel the same in every community. Write 5 signs of springs that can be observed in your community. Spring forward by writing a formula for answering this question. | Or calculate Spring Has Sprung! Explore how to establish a schoolyard habitat | Make a butterfly garden in the spring for butterflies in the summer and autumn.